BISHOP PAUL P. GOJDICH, O.S.B.M. BISHOP PAUL P, GOJDICH, O.S.B.M. "God is love. let us love Him!" Bishop Gojdich did not seek episcopal dignity. Rather he chose a hidden life in the Basilian order as a monk. But Divine Providence placed him at the helm of the Prjashev Eparchy, As a Good Shepherd he served his people with dedication and love. Fragile in body but strong in spirit, he distinguished himself by the holiness of his life. In his dedicated work he was sustained by his great love of God and his people. The Communists condemned him for his loyalty to the Catholic Church. He died in prison as our valiant Confessor. Bishop Paul P. Gojdich, O.S.B.M. was born to a priestly family on July 17, 1988, in Rus'ki Pakljany, Sharish District, presently in Eastern Slovakia. After his graduation from the gymnasium in Prjashev, he continued his philosophical and theological studies at the Central Seminary in Budapest, and was ordained a celibate priest on August 27, 1911. In the fall of 1912, after a short period of pastoral work, he was appointed prefect of the Eparchial Boarding School for boys in Prjashev, known as "The Alumneum." At the same time he became an instructor of religion in the city's secondary schools. The young students found in him an inspiring leader and spiritual guide. Several years later Father Gojdich was appointed to the Bishop's Chancery Office, where eventually he achieved the rank of Chancellor. The promise of a swift career did not attract him. He yearned for a more peaceful and prayerful life, so he decided to become a Basilian monk. In 1922, Father Gojdich entered St. Nicholas Monastery on Chernecha Hora, near Mukachevo. As a Basilian, Father Gojdich became an exemplary monk, zealous missionary, and dedicated guide of youth. Appointed Director of the Apostleship of Prayer, he became instrumental in spreading the practice of frequent confession and holy communion throughout the Eparchy of Mukachevo. Taking into consideration his wide activity in those days, one wonders where he found the time and the strength to accomplish so many things. The answer was simple--the Eucharistic Christ. He usually spent long hours, mostly at night, in the chapel before the tabernacle. There he refreshed his spirit, regained his strength, and found new inspiration. After having charged his heart with love of God in prayer, he then channeled this love toward his apostolic work. As in the case of St. Paul, the love of Christ was indeed compelling him (2. Cor. 5:14). Behind the monastic walls he found the fulfillment of his heart's desires. But this happiness did not last long, for in the fall of 1926 he was summoned back to Prjashev as the Apostolic Administrator. Father Gojdich tried to decline this unexpected appointment, since he had not yet made his solemn profession as a Basilian monk. But it was to no avail. He was instructed to make his monastic profession as soon as possible, and then come to Rome for his episcopal ordination. He was ordained bishop at the Basilica of St. Clement in Rome, on the Feast of the Annunciation, March 25, 1927. After his consecration Pope Pius XI presented Bishop Gojdich with a gold pectoral cross, saying: "This cross is only a symbol of all those heavy crosses that you will have to carry during your episcopal ministry. But take courage, my son, the good Lord will help you carry them with dignity and love." 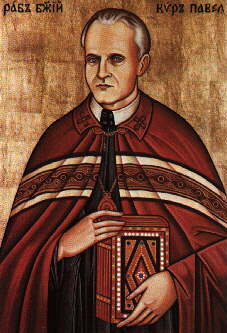 Bishop Gojdich proved himself to be indeed a Good Shepherd, wholeheartedly dedicated to his new tasks. His tireless efforts to promote the spiritual life of his faithful and to strengthen their Catholic faith can hardly be described. Much can be said about his works of charity. God only knows how many people were helped or assisted by him. His charity and kindness were proverbial. He still showed his fatherly concern for youth, orphans, religious press, parochial schools, eparchial institutions, religious communities, etc. The Communists came into power in Czechoslovakia in the spring of 1948. They immediately launched a vicious attack against the Greek Catholic Church and maliciously denounced Bishop Gojdich as a traitor and an enemy of the people. It was evident that the Communist authorities decided to liquidate the Eparchy of Prjashev just as they liquidated the Eparchy of Mukachevo. Bishop Gojdich, the good shepherd, prepared his faithful for the inevitable. "My dear people, we must be ready to face the most difficult times in the history of our Church. But remember the early Christians. For their faith they were ready to sacrifice everything, even their own lives. They trusted our Divine Savior, Who said: "Blessed are you when they persecute you and insult you on account of my name. Rejoice and be glad for your reward will be great in heaven!"(Mt. 5:11-12). Therefore, take courage and hold fast to your faith." On April 28, 1950, the Communists forcibly liquidated the Greek Catholic Church in Czechoslovakia and imprisoned Bishop Gojdich for "opposing the people's will." Several months later he was tried for "treason and espionage," and condemned to life imprisonment. The people, however, were convinced that their Bishop was innocent of alleged crimes. They knew that he was imprisoned and condemned only for his unwavering loyalty to the Catholic Church. It was obvious that the Communists fabricated their accusations against him after his imprisonment to justify their forced liquidation of the Prjashev Eparchy. The bishop's trial in Bratislava was indeed a "parody of justice," and the faithful rightly considered him A Confessor of the Faith. "After his trial, Bishop Gojdich was transferred from one prison to another, and was forced to work as an ordinary prisoner. There was no work too humiliating for him. He often volunteered for a job which other prisoners refused to do. In this way he wanted to learn the true meaning of Christian humility. He felt happy that in such an easy way he was able to please the good Lord. "During his prison years Bishop Gojdich did not have any problems with the local authorities. He accepted their cruelty and intentional hardships, including a solitary cell, with complete resignation to the holy will of God. His face was constantly reflecting his inner peace and happiness. He looked as innocent as a child. His presence alone soothed and strengthened us all." Bishop Gojdich was constantly moved from one prison to another. The prison authorities did not want the people to know where their Bishop was locked up. However, the people always learned of his whereabouts and used to come in procession to pray for their saintly bishop. Of course, they were not permitted inside the prison and had to remain outside the walls. They usually gathered in front of the barred window of the Bishop's cell and there they prayed and sang religious songs. These were the people whom Bishop Gojdich, according to the communist allegations, "hated and betrayed." During Bishop Gojdich's rehabilitation in 1958, it was proven beyond any doubt that all the accusations against him at the trial were nothing more than lies made up by his prosecutors in order to keep him in prison and isolated from his faithful. "Bishop Gojdich cherished an immense love for his clergy and people. He often spoke of Greek Catholic customs and ceremonies, and with great enthusiasm used to explain why his people must remain united with the Apostolic See. He told us how, during his long interrogations, they used to torture him and how they tried, with all kinds of promises to sway him to accept Orthodoxy. They even promised to make him a patriarch ..." And he concludes: "There is no doubt in my mind that Bishop Gojdich was a martyr for his Faith!" In prison Bishop Gojdich never complained about his own pains, so everyone believed that he was in good health. Then suddenly he became seriously ill. They rushed him to the prison hospital, but the doctors were unable to find anything wrong with him, even though his pains persisted. He was in and out of the hospital several times. Finally the doctors became suspicious. They sent him to a famous clinic in Brno, Moravia. There they diagnosed that he had cancer which was terminal. Upon his return to Leopoldov prison he was immediately placed in the hospital, where he remained until his saintly death. A few weeks before his death a high official from the Ministry of the interior came to see Bishop Gojdich and promised him amnesty. It somewhat disturbed the Bishop, but later he declared: "I do not think it worthwhile to exchange my martyr's crown for two or three years of freedom. However, I leave the decision to God. Let Him do as He pleases!" Of course, the Communist authorities never kept their word and Bishop Gojdich remained in the prison. As his condition became more grave, his sufferings and pain increased. Finally. he ended the course of his saintly life on his 72nd birthday, July 17. 1960, in the prison of Leopoldov, Slovakia. For ten long years he carried the chains of Christ, giving a living testimony to his heroic faith and loyalty to the Apostolic See. He truly died as our valiant Confessor. During his first Way of the Cross at the Colosseum on Good Friday, 1979, Pope John Paul II said: "Just as Christ has a special place in our hearts because of His Passion, so do the martyrs and confessors of our own times. It is our duty and obligation to talk about the sufferings of these modern confessors of Christ and to bear witness to them before the conscience of the entire world." Yes, our valiant Confessor, Bishop Paul P. Gojdich, O.S.B.M., has a special place in our hearts because of his great sufferings and love. It is our sacred duty and obligation to talk about his saintly life and to pray for his quick beatification. May it please the good Lord to grant us this favor, and grant it to us soon! ..
"I am certain that at the end truth will triumph over lies, and love will overcome hatred. I do not hate my enemies. I would like to bring them closer to Christ, of course not by force or deceit but by love and truth." "Our present afflictions will neither break us nor separate us from the true Church and love of Christ. On the contrary. Persecution and sufferings will only strengthen our faith and bring us closer to Christ and His Church."